One simple gesture, the K’intu – enough, nothing and everything. I am a prayer walker in this world and in all worlds offering a simple K’intu, speaking from my heart as an invitation to unite all that I love. I’m walking a beautyway path of service to all our relations, the next seven generations and beyond. One k’intu sent with intention reverberates out into all seven directions. Prayer is the bridge to the unknown inviting the unknown to be made visible. 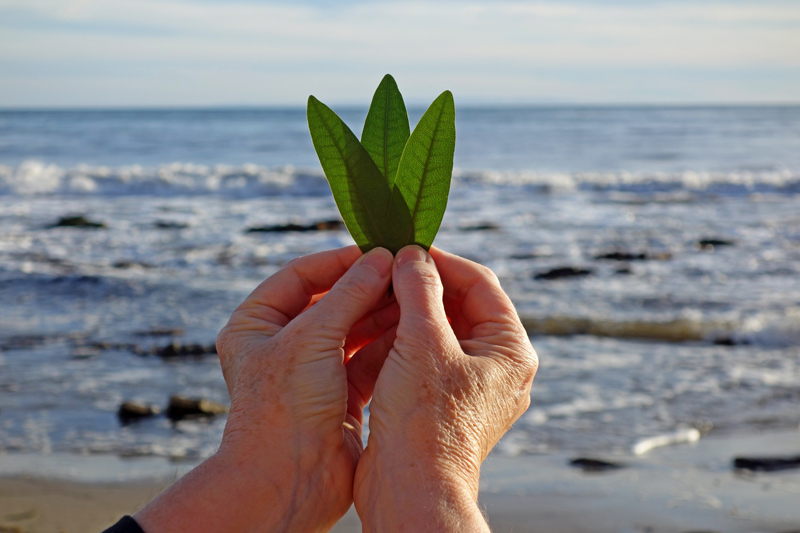 Here at the eastern edge of the Pacific Ocean, I often make ritual feedings, (Mikhushankus), to Mama Cocha. I can feel the presence of the watchers (Tirakuna) and all the holy elements watching while I sprinkle white sage, cornmeal, tobacco or a libation on the sand. All that is sacred to me is being restored in beauty, with each gesture and offering bringing balance and harmony to all worlds. Last fall I offered a ceremony in my community. Most everyone was new to the Pachakuti Mesa Tradition. I set up a mesa and called in the Cosmovision, called in the ancestors, spirit helpers, animal and plant allies, and offered gratitude to the spirits of this hallowed land. The ceremony was called to honor our grief with love. The altar was adorned with carefully placed pictures and personal effects in reverence to our loved ones, our memories of them imbued in a pair of boots, a necklace, envelopes, papers with notes, a heart shaped rock, and a pouch containing a memento. The keepsakes were placed there to honor those who have made their journey to the stars. The ritual that guided our circle was the offering of one, three-leaf k’intu from each person. I was awed by the countenance on each of our brother’s and sister’s faces as they held their first k’intus, peering into the face of the great mystery. The portals opened, and we were shapeshifting into receptacles receiving and transmitting this loving energy to one another, to our loved ones, and to the Pachamama. The space was infused with the scent of the fresh picked bay leaves, and as they breathed their first breath into the k’intus, the atmosphere was palpable with potent magic and medicine from the seen and unseen worlds. Around the circle we were being transported by the language of the soul, as we silently, or in whispers, prayed what was in our hearts. As they touched their k’intus to their foreheads, hearts and bellies the energy was infused with the sacred, and one could sense the hand of the Holy Ones inspiring and guiding the communion. A deep state of reverence filled the room like a transparent mist. The portals opened, and our hearts became vessels from which to talk to spirit, listen to spirit, and receive guidance. All that we love was transformed by this intimate conversation, consecration and communion. All this in one simple gesture of a three-leaf k’intu. 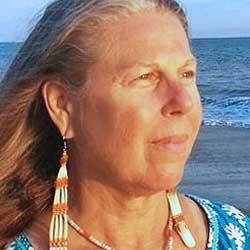 I was guided to carry the prayers we had breathed into the k’intus to the holy element of water; to Mama Cocha. Everyone had placed their k’intus into an abalone shell. 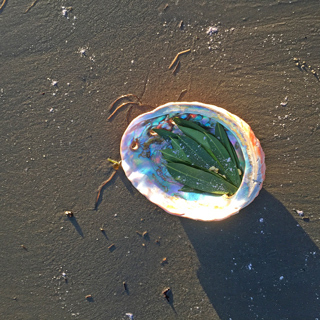 The abalone shell is a medicine arte, a holy vessel reflecting rainbow light. The shell arte symbolizes everlasting life carrying with it the wisdom that we are family with the living sea. 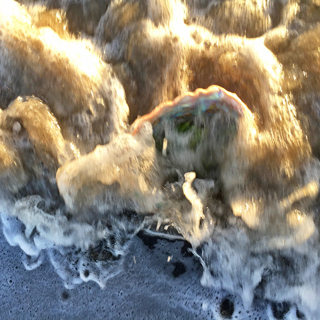 The abalone reminds us of our interdependence within the web of life. It is a revered receptacle to gestate and offer our prayers. Nearby to where I stood in the sand, the sea birds were gathering to feed. From out of the vast, blue sky of late afternoon, they arrived both gliding and with wings fluttering as heavenly hues shone down, reflected in the cool, wet sand receiving my footsteps. During the magic hour when the sun begins its descent into evening, the rocks, trees and mountains reflect the golden glow. The gentle wind soothed my skin and sent ripples out across the water. I breathed deep into my heart the comingling of these sanctified energies. I placed the abalone beside my feet, sprinkled the cornmeal, and watched it intermingle with the textures of the glistening sand surrounding the abalone shell. The prayers, like hungry little birds nested within the k’intus, awaited their release into the natural world. One could sense their journey as they readied themselves for flight. There was a stillness behind the veil of all the rhythmic waves of movement. I was enveloped by the exquisite beauty and the raw unbridled forces of nature. 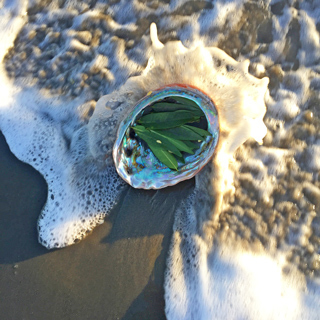 Mama Cocha surged up to where I stood kissing my feet with her salty waters, and on that day her frothy, white foam engulfed the abalone shell bringing with it sami, a bubbly life force energy. The animated effervescence of sami swirled about, washing the k’intus and initiating a playful delivery of the prayers. The heaviness of the grieving during the ceremony had been transmuted into the lightness of love. Sami blessed us and delivered the prayers into Mama Cocha’s holy womb, spreading them around the Pachamama and up to the celestial canopy; the beauty of the natural, mama pacha world awaits our remembering. One simple gesture, the K’intu – enough, nothing and everything.